Hi this is my first post here, tbh I didn't know where else at all to get advice or anyone who would care about the finer details of character creation. I'm making a plate wearer, so far class undecided but using the ferocity and noon time presets as a base for the personality. I have a nitpick with the in-game character creation though, I want a face with more "character" ie less human looking. I really like everything about this one I made except the completely clownish smile it does. So please talk me into ignoring this occasional annoyance! You don't have a choice. Either you pick the face you made and deal with that small detail you don't like, or pick a face that doesn't have a smile by default (there are some, especially in the makeover kit exclusives) and try to do something out of it. There's no other option there. You could also potentially pick up a hat that covers her mouth! For example, the Adventurer's Scarf from Dry Top is a bandana that's fairly cheap. You can look at the wardrobe in the bank to see if there are other options you might like more. All female sylvari smile like that. Doesn't matter which face you use. It's just part of their idle animation. It's true. 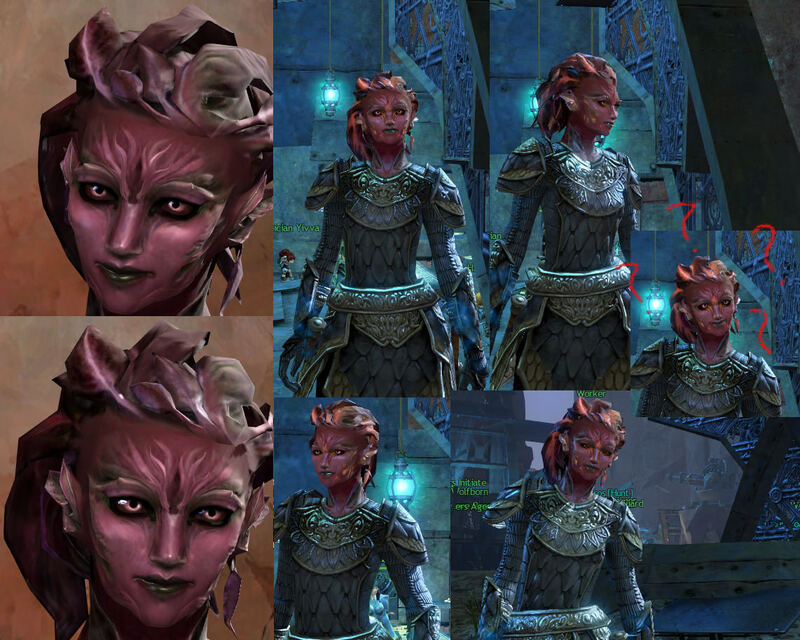 All sylvari women smile during the animation, though some look better than others. It's unavoidable. Keep in mind this might be a case of the lighting not being particularly flattering. Try watching the idle animation in other light conditions. If you still can't get over it, and you don't mind recreating the character, you could try increasing or decreasing the size of the lips. Or trying other faces enterely until you find one whose smile you can stomach.